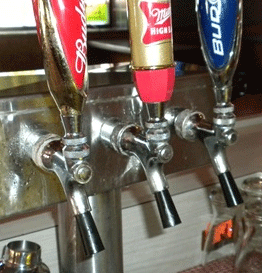 Finally there's a way to lock your tap and keep unwanted pests from contaminating your beer faucet. No more stuffing your taps with rolled napkins, strips of cellophane or shaved corks. The polyurethane Bug Plug is an inexpensive way to control the ever-growing problem of fruit flies in and around draft beer spigots. Simply insert the hard plastic Bug Plug into a standard draft beer faucet when the tap is not in use to control yeast and bacteria build-up as well as fruit fly reproduction. Bug Plugs are often used in conjunction with our Standard Tap Lock and Chrome Faucet Extender. Attention: This product does NOT fit the Tapered Style Perlick Faucets although, our Bug Blocker will fit.